Vidon Box is an Allwinner A31s based TV box made by Vidon.me, a Diamond sponsor for Kodi entertainment center. I’ve already listed specs, subscriber services, and uploaded pictures in the unboxing post, so it’s time for a review. Since Allwinner A31s has been around for a while, I’ve decided to write a shorter review. Since the box provides some services with a subscription, with a free 1-year top-up card included, you’ll probably want to register an account on Vidon.me first, as it’s needed to activate all services in the box as shown on the back of the top-up card. After the optional Subscription is $14.99 per year, and it’s only needed if you need features like Blu-ray navigation, or audio pass-through. The simple remote included does the job if you only use the box for settings and XBMC, but otherwise you’ll need an air mouse, or wireless keyboard. Just make sure you remove the plastic under the battery to make it work. I’ve connected all required cables, and a bunch if USB devices, and for the very first boot you go through a wizard to set the language, configure the display (720/1080p/i video output and screen scale), the network (Wi-Fi or Ethernet), the time, audio output (HDMI or S/PDIF, and disable/enable pass-through), check for firmware update, and login with you Vidon.me username and password7vagywbpojka. There was a new firmware for the device, and although the download for the 322MB firmware (SDK 1.2) took over 2 hours, the process went smoothly, but at next start-up, it went through the wizard again, and it detected yet another update, smaller (50.96MB) and called VMC (maybe standing for Vidon.me XBMC?). Subsequent boots take about 45 seconds. They’ve revamped the user interface they had in Vidon.me AV200, and black/white/grey home screen shows the list of app directly. 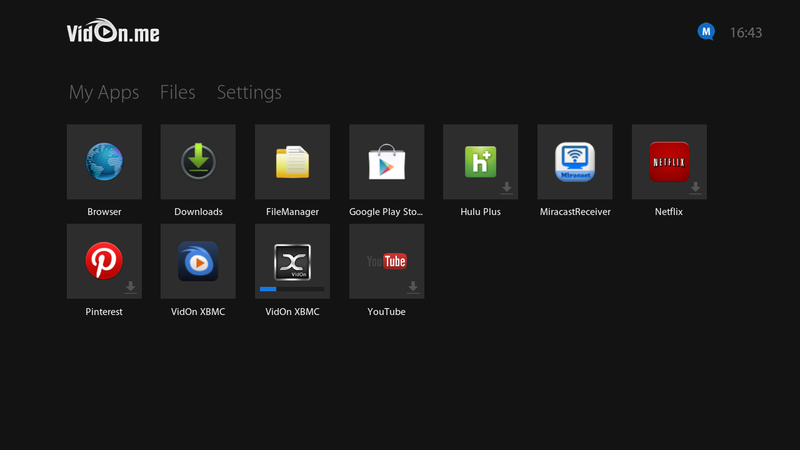 There’s also an option to autostart XBMC. The apps with a grey down arrow are not installed yet, you need to click on them, and they will be downloaded and installed. If you want to check all settings available, I’ve recorded the Android screen with all options in the video below. Power handling is all good, as you can enter/exit standby, and power on/off cleanly with the remote control. Temperature after Anautu was 38 C on both side of the device, but the shiny metallic enclosure may have interfered with my IR thermometer, as the temperature felt higher with my hand. The system performs nicely most of the time, but if you are installing apps, you’d better wait, as it becomes hardly usable. Google Play works fine for me. 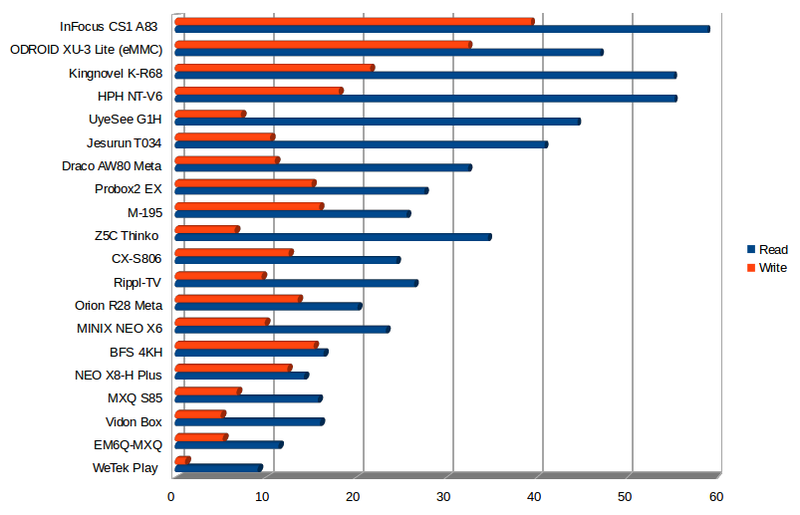 Stability is good, but I had one system freeze in XBMC once while playing a 3D video. 1080p Over/Under 3D Video – First time: system hang, power cycle required. Second try: Plays like in slow motion. I’ve also run Antutu Video Tester, and Vidon Box got an average score with 490 points. Not quite as good as devices with more recent Allwinner processor (e.g. A80/A83T). Network performance over Wi-Fi is tested by transferring a 278 MB file using ES File Explorer to a SAMBA server, and vice versa. Results: 3.09 MB/s average transfer speed, which places it in the top of the 802.11n device in terms of Wi-Fi performance. I did the same with Ethernet, and the speed is a bit slow, but as well see below, this tests is affected by the internal flash read speed. Raw Ethernet performance with iperf show good performance in one direction, but problem to handle full duplex at full speed. Following comments from a reader, I’ve replaced the FAT32 partition in my USB 3.0 hard drive by exFAT, especially since I’ve already testing FAT32 with a (micro) SD card and/or USB flash drive. So now I have 4 partitions with NTFS, EXT-4, FAT32, and BTRFS in the drive. 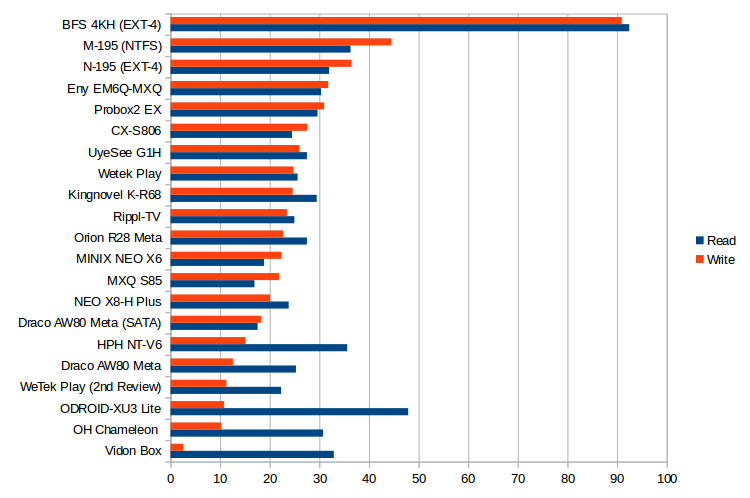 I tested read and write performance for USB NTFS and the internal storage using A1 SD Bench app. 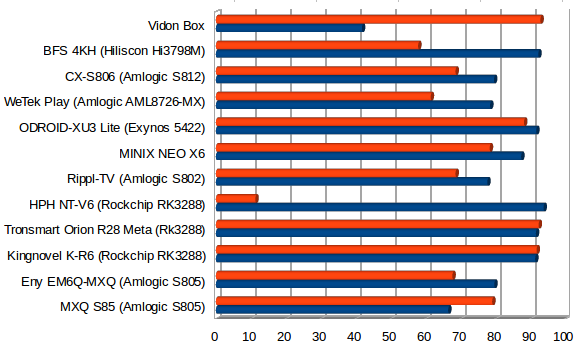 Despite a decent read performance via USB (32.92 MB/s), Vidon Box is the wort performing device with USB device because of a dismissal write performance (2.59 MB/s). I also ran the test with the exFAT partition in case the culprit was the NTFS partition, but it’s not much better: 26.57 MB/s and 3.38 MB/s, so something is very wrong here. The internal storage performance also places it with other low end device, and the poor write performance also explains why the device is not really usable while installed apps. I’ve tested one game (Beach Buggy Racing) and graphics performance is OK, but it’s very unpleasant to play because Tronsmart Mars G01 gamepad can connect, but it’s unusable (no reaction, and it’s the first time it happens), so I had to use the Mele F10 Deluxe air mouse to play. 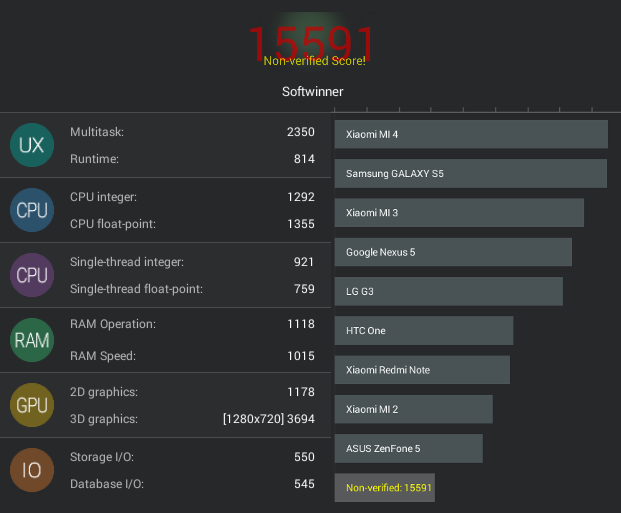 I’ve only run Antutu 5.6 benchmark, and with a score of 15,591 points is roughly where a quad cortex Cortex A7 device should be. VidOn Box is a good looking device that runs OK, with excellent Wi-Fi, and only quickly tested video playback, and H.265, MPEG-2 and Bluray are Ok in XBMC, but 3D videos and 4K videos somehow do not work, even though Allwinner A31(s) is supposed to support the latter at least. Wi-Fi is one of the best, Ethernet average, but storage is really poor when it comes to write speed both for internal storage, and especially USB storage. Future firmware upgrades promise Mobile Transfer, Photo Backup, Mobile Access, and more. The flash is partitioned with a 1GB app partition, and a ~4GB data partition, which may lead to issues install many apps. Standard features like audio pass-through and Blu-ray navigation require a $14.99 annual subscription fee. Vidon Box can either be purchased directly on Vidon.me for $69.99 including shipping and one free year of membership, or via other websites such as GeekBuying and Aliexpress. After one year, membership costs $14.99 per year, or $1.99 per month, and is optional for most features. Are the Sources for the Allwinner GPU available? If Allwinner does not provide OSS Support of their Chipset they will be eaten by Intel and AMD alive. For most ARM SoC, no source code. 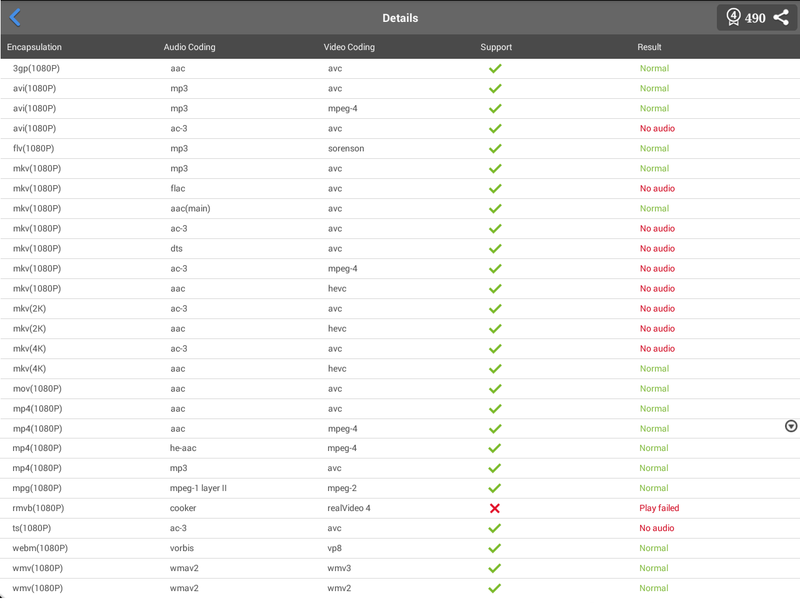 They just provide usable binaries for Android, and more or less usable binaries for Linux. 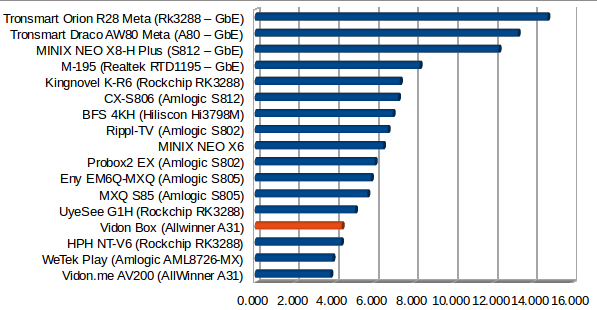 But you’re right that Allwinner and other ARM SoCs have some serious competition from the x86 world. 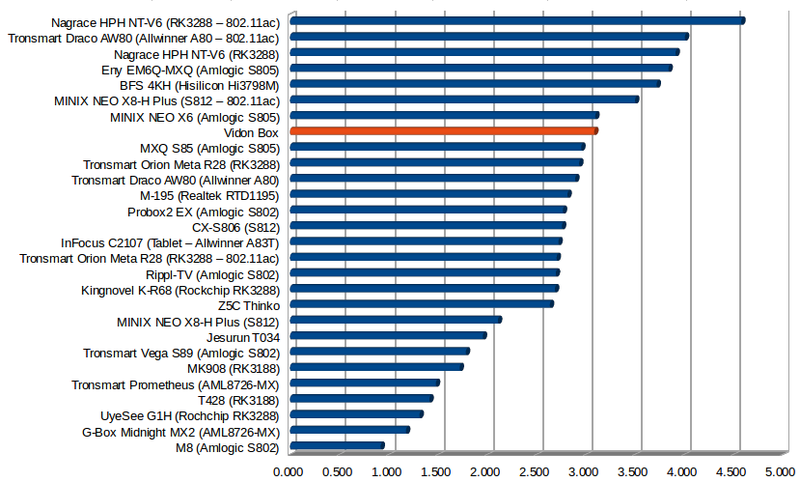 The price and power consumption advantage has dwindled, and AMD/Intel have open source GPU drivers. audio passthrough needs annual subscription?!?! WTF! Don’t worry,after a year you will not need the box. There will be something out there cheaper and better.